The Government of Canada’s 1996 Policy Framework for Radioactive Waste provides the national context for radioactive waste management, along with a set of principles to ensure that this management of radioactive waste is carried out in a safe, environmentally sound manner. Radioactive waste is defined as any material (liquid, gaseous or solid) that contains a radioactive nuclear substance for which the owner has no foreseen use and which is determined to be a waste product. The Government of Canada and the nuclear industry are developing long-term radioactive waste management solutions that protect the health, safety and security of persons and the environment. What are the licensing steps for a deep geologic repository? What is the technical assessment process for licence applications? What kind of research does the CNSC conduct on geologic repositories? How does the CNSC verify compliance at radioactive waste management facilities? How does the CNSC ensure that radioactive waste is transported safely to waste management facilities? What are the CNSC’s international responsibilities for radioactive waste? Why does Canada have radioactive waste management facilities? The Canadian Nuclear Safety Commission regulates the use of nuclear energy and materials to protect health, safety, security and the environment; to implement Canada&rsquo;s international commitments on the peaceful use of nuclear energy; and to disseminate objective scientific, technical and regulatory information to the public. The CNSC licenses, monitors and inspects nuclear facilities in Canada, including radioactive waste management facilities. All the radioactive waste in Canada, including used nuclear fuel, is currently held in safe, secure and environmentally sound interim storage facilities. As the Canadian nuclear regulator, the CNSC is responsible for licensing geologic repositories intended for the long-term management of radioactive waste. A geologic repository is constructed underground – usually at a depth of several hundred metres or more below the surface – in a stable rock formation. Currently in Canada, there are two long-term radioactive waste management initiatives underway that may result in geologic repositories. Ontario Power Generation (OPG) is proposing the construction of a deep rock vault in clay-rich limestone, hundreds of metres below ground. This Deep Geologic Repository (DGR) would be a long-term management facility for OPG’s low- and intermediate-level radioactive wastes. The proposed location for the DGR is at the Bruce nuclear site in Tiverton, Ontario (Municipality of Kincardine). In June 2007, the federal Minister of the Environment referred the DGR project to a joint review panel (JRP) to review the environmental assessment and the first stages of the licensing process. Public hearings took place in 2013 and 2014, and the JRP will submit its environmental assessment report to the Minister of the Environment for a final decision. More information about this project is available at www.opg.com. Established in 2002 to assume responsibility for the long-term management of Canada’s used nuclear fuel, the Nuclear Waste Management Organization (NWMO) consulted with Canadians on a process for identifying an informed and willing community to host a geologic repository for Canada’s used nuclear fuel. After a comprehensive three-year study and public engagement, the Government of Canada selected the NWMO’s Adaptive Phased Management (APM) approach for the safe and secure long-term management of used nuclear fuel. In 2010, the NWMO launched its site selection process, to select an informed and willing community to host a deep geologic repository, in a suitable rock formation. The NWMO is proceeding with this nine-step process through preliminary assessments of site suitability for the long-term management of Canada’s used nuclear fuel. Learn more at nwmo.ca. The NWMO has not yet submitted a licence application to the CNSC for a deep geologic repository for used nuclear fuel. However, it is an international best practice for nuclear regulators to get involved as soon as possible in any initiative that may involve the development of a deep geologic repository for used nuclear fuel. The CNSC became involved early in the process, to ensure that the future licence applicant, the NWMO, and any potentially affected communities have a comprehensive understanding of the CNSC’s role in regulating Canada’s nuclear sector and in the licensing process for such future projects. The CNSC signed a service arrangement with the NWMO to provide regulatory guidance before the submission of a licence application. These services also include pre-project design reviews of APM deep geologic repository concepts, identifying regulatory requirements for a deep geologic repository, and participating in public meetings to provide regulatory information. The CNSC uses a comprehensive licensing system that covers the entire lifecycle of a geologic repository – from site preparation to construction, operation, decommissioning (closure and post-closure) and, finally, abandonment (release from CNSC licence). This approach requires a separate licence at each phase, although the site preparation and site construction licence can be combined. The CNSC’s regulatory philosophy for radioactive waste stems from the Nuclear Safety and Control Act (NSCA) and is articulated in CNSC documents P-299, Regulatory Fundamentals, P-290, Managing Radioactive Waste, and G-320, Assessing the Long Term Safety of Radioactive Waste Management. Within the current Government of Canada policy, waste producers and owners are responsible for the funding, management and operation of interim and long-term waste management facilities, so the next generations of Canadians are not burdened with the cost. This responsibility is also known as "the polluter pays" principle. One exception is historic waste, for which the Government of Canada assumes responsibility. Sweden and Finland also have initiatives underway to develop geologic repositories for used nuclear fuel. Canada’s nuclear power program has produced over 2.5 million used fuel bundles over the past half-century. If these bundles were stacked end to end, they would fit into a space the size of seven hockey rinks stacked to the top of the boards. In a licence application, an applicant must include information about a facility’s operation and future decommissioning, including financial guarantees for each phase. Financial guarantees ensure that licensees have sufficient funds to cover the cost of decommissioning work resulting from the licensed activity. The outcome of the licensing process feeds back into a compliance program, which verifies that the licensee fulfills their regulatory obligations. The public has several opportunities to participate and be heard throughout the EA and licensing processes (see Figure 1). How can the public participate in the licensing of geologic repositories? To participate in public hearings, interventions can be made in either one of Canada’s official languages, and may be written, or written and oral. The CNSC webcasts its public hearings and meetings, and keeps an archive of previous webcasts at nuclearsafety.gc.ca. Public hearing agendas are available on our website before each public hearing. Through its Participant Funding Program, the CNSC can offer funding to eligible applicants to assist in covering some of the costs of participating in the CNSC’s regulatory processes. The CNSC is committed to transparency. Engaging stakeholders, Aboriginal groups and the public, through a variety of consultation opportunities – set early and well in advance of any submissions for new nuclear projects – ensures effective dialogue and information sharing. Once a licence application has been received, the review process begins. As noted in Figure 1, this process allows opportunities for the public and Aboriginal groups to participate. The CNSC has a duty to consult with Aboriginal communities when Aboriginal rights or interests could be adversely impacted, and recognizes the importance of consulting and building relationships with Canada’s First Nations. The Commission also holds formal public hearings. Members of the public and Aboriginal groups are welcome to observe these hearings, or to actively participate as interveners. The Commission may also accommodate intervener participation in its proceedings by teleconference or videoconference. CNSC experts and technical specialists conduct a thorough technical assessment of any information submitted by applicants in support of their applications. This assessment is usually carried out with input from other federal, provincial and territorial government departments and agencies responsible for regulating health and safety, environmental protection, emergency preparedness and the transportation of dangerous goods. The technical assessment focuses on determining whether the proposed design and safety analysis (along with any other required information) complies with regulatory requirements. This review demands rigorous engineering and scientific analyses, taking into consideration the CNSC’s experience and knowledge of best practices in radioactive waste management from existing facilities in Canada and around the world. 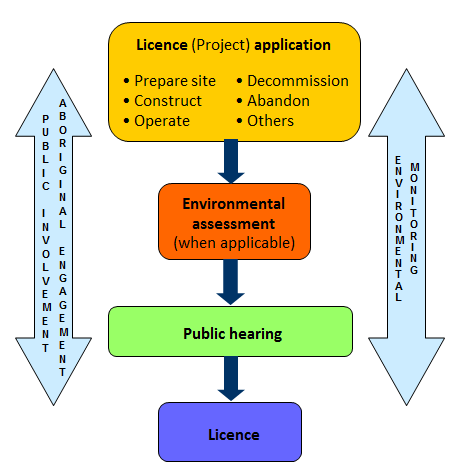 Depending on the phase of the project, these licence applications may also include an evaluation by CNSC experts of the licensee’s public information programs, packaging and transportation, safeguards, waste management, emergency preparedness, environmental protection, occupational health and safety, radiation protection, physical design, operations or management systems. Similar to other nuclear facilities, the licensing of geologic repositories in Canada must address the requirements and regulations made under the NSCA – the cornerstone of the CNSC regulatory framework. Licensing must also address the CNSC’s commitment to international standards and best practices, including those of the International Atomic Energy Agency (IAEA). Canadians can be assured that any geologic repository built in Canada will meet the highest standards for health, safety, security and environmental protection. The CNSC’s commitment to international standards and best practices assures that the management of radioactive waste in Canada meets the highest requirements for health, safety, security and environmental protection. Through participation in international forums, the CNSC stays informed of best practices in radioactive waste management. The CNSC ensures that proper security measures are in place for nuclear facilities and that nuclear sector workers’ health is protected. Since 1978, the CNSC has been involved in independent research and assessment, including international collaboration, on the safe long-term management of used nuclear fuel in deep geologic repositories. In particular, these activities looked at the Canadian Shield’s granitic rock as a suitable rock formation for such repositories. In 2008, CNSC staff began to expand their technical expertise, to include knowledge and understanding of deep geologic repositories in sedimentary rocks. This has provided staff with sufficient independent knowledge to assess OPG’s application for a site preparation and construction licence for a deep geologic repository for its low- and intermediate-level radioactive waste in a sedimentary rock formation. CNSC staff keep this knowledge up to date through their own independent research programs, to better assess future proposals for disposal in sedimentary rocks. The CNSC is conducting a coordinated assessment and research program to evaluate long-term (up to a million years) safety issues for deep geological repositories for radioactive waste and used nuclear fuel in sedimentary rock. This program consists of independent scientific research, conducted by CNSC staff in collaboration with national and international organizations. It also includes monitoring and reviewing state-of-the-art scientific advancements, and participation in international forums to exchange information and knowledge on geologic repositories. More information on the CNSC’s research on geologic repositories can be found on the CNSC website. Once the CNSC issues a licence, the licensee must comply with the requirements of the NSCA and its associated regulations, as well as the specific conditions of their licence. The CNSC has compliance programs for all regulated nuclear facilities in Canada (including any future deep geologic repositories) to ensure these requirements are respected. At existing radioactive waste management facilities, the CNSC verifies compliance by reviewing programs and reports submitted by the licensee, such as unplanned event reports and periodic performance reports (which include radiation and environmental monitoring results). CNSC staff conduct regular site inspections of radioactive waste management facilities, to make sure that radioactive waste containment systems remain appropriate and safe, and to ensure that licensees’ radioactive waste-related activities and inventory statistics are properly reported. Inspectors also perform radiation monitoring and take environmental samples of air quality and liquid effluent, to verify that facilities operate within the limits established in their licence. The CNSC can also perform unannounced inspections. In conjunction with the CNSC, the IAEA monitors Canada’s used nuclear fuel storage facilities to verify that these facilities comply with Canada’s obligations under the Canada/IAEA safeguards agreements, stemming from the Treaty on the Non-Proliferation of Nuclear Weapons. These agreements give the IAEA the right and obligation to monitor Canada’s nuclear-related activities, and to verify nuclear material inventories and transactions. The CNSC works with its licensees to inform them about regulatory expectations and licence requirements. When necessary, the CNSC uses a graded series of enforcement actions to ensure compliance and to protect workers, the public and the environment, and to respect Canada’s international agreements. The responsibility to regulate the safe transport of nuclear substances, including radioactive waste, is jointly shared between the CNSC and Transport Canada. Transport Canada’s Transportation of Dangerous Goods Regulations (TDGR) deal with the transport of all classes of dangerous goods, while the CNSC’s Packaging and Transport of Nuclear Substances Regulations (PTNSR) are primarily concerned with health, safety and security of the public, and protection of the environment as they relate to the special characteristics of radioactive materials. Both the TDGR and PTNSR apply to all persons who handle, offer for transport, transport or receive nuclear substances. The PTNSR are based on the IAEA Regulations for the Safe Transport of Radioactive Material. There has never been a transport accident involving nuclear substances in Canada that resulted in an impact on the health and safety of people or the environment. The CNSC will not issue a licence or package certification unless it is convinced that the shipment will be completed safely, without posing risks to the health, safety or security of Canadians and the environment. The basic philosophy guiding the development of the PTNSR is that safety relies heavily on the design of the transport package. Package designs are combined with additional regulatory controls (including labeling, placarding, quality assurance and maintenance records) and allow for radioactive material to be carried safely using any mode of transport – such as road, rail, air and sea transportation. All nuclear substances are transported in packages selected according to the nature, form and quantity or activity of the substance. General design requirements apply to all package types, to ensure that they can be handled safely and easily, secured properly, and are able to withstand routine conditions of transport. For further information on how the CNSC ensures safe transport of nuclear substances in Canada, refer to the CNSC fact sheet on Regulating the Packaging and Transport of Nuclear Substances in Canada. As long-term strategies and solutions for the safe management of used nuclear fuel and radioactive waste evolve, the Government of Canada must continue to demonstrate how it meets its international obligations under the terms of the Joint Convention on the Safety of Spent Fuel Management and on the Safety of Radioactive Waste Management. This international agreement aims to ensure worldwide safe management of used nuclear fuel and radioactive waste – an objective that is achieved through the peer review of a country’s radioactive waste management programs. Every three years, the Government of Canada issues Canada’s National Report for the Joint Convention on the Safety of Spent Fuel Management and on the Safety of Radioactive Waste Management. The CNSC coordinates the preparation of this national report with other Government of Canada departments and the nuclear industry, to demonstrate how Canada is meeting its international obligations and to report on its radioactive waste inventories to the IAEA. Licensed activities produce many types of radioactive waste, such as uranium mill tailings, used nuclear fuel, and cleaning material contaminated with low levels of nuclear substances. Each of these waste categories presents its own level of hazard and requires safe storage facilities. Since all the nuclear substances associated with licensed activities will eventually become radioactive waste, the safe management of that radioactive waste is taken into consideration during the review process for any licensed activity. One of the CNSC’s principles is that the licensee must minimize the generation of radioactive waste as much as possible – this can be achieved with the implementation of design measures, operating procedures and decommissioning practices.